Deluxe Baby Girl Personalised Christening Keepsake Box Gift. A contemporary and luxury in quality, keepsake box. The box is white and classy with a silver felt interior. Inside is a handy shelf and a silver metal clasp opens and seals the box. It is well sized to fit a couple of cherished items. 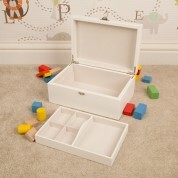 Perfect for a Christening gift to a baby girl, this box presents itself as a timeless, quality and classy present. Personalize your box with a name of the child being Christened. Please ensure that your choice of initials are correct before proceeding to checkout. The box is personalised using our hand illustrated and watercolor letter range. The alphabet animal letters have double phonetic characteristics such as adventurous alligator and Mary moose. The colourful animal design was created by local illustrators in Ayrshire, Scotland and offers two options per common letters to avoid repetition. Personalisation of the watercolor letters is permanently printed onto the box through our exceptional UV printing technology. Box will display chosen name and ‘My Christening Keepsake box’ in baby pink with option to add date of Christening below the occasion text.